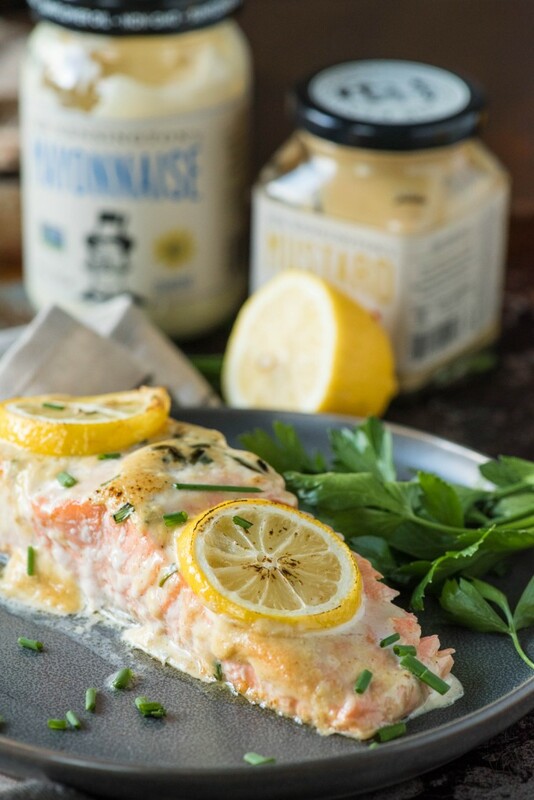 This Baked Lemon Salmon recipe has a delicious and easy dijonnaise sauce- a perfect dish for busy evenings, any time of the year! If you haven’t noticed yet, the holidays are in full swing all around you now. No matter how much I try to work ahead, and plan efficiently, I am always running full steam until December 26. This doesn’t change the fact that this is still my favorite time of year. In fact, I am sitting here writing this at 1 AM in the soft glow of my Christmas tree and fireplace garland, reveling in the quiet and serenity. The days are so busy already that my best work time falls well after I get the kids to bed. And if I can get Dave to bed too, so I’m truly alone? Talk about major productivity-ville. But real life still goes on through the holidays- it is just added on with shopping lists, tons of grocery store trips and oh yes, make sure you throw in plenty of baking. Those cookies aren’t going to make themselves for Santa! 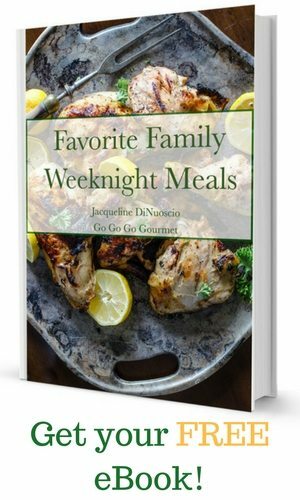 This time of year, I LIVE for recipes that fit a few basic criteria- very few dishes, very little prep, and very little effort. 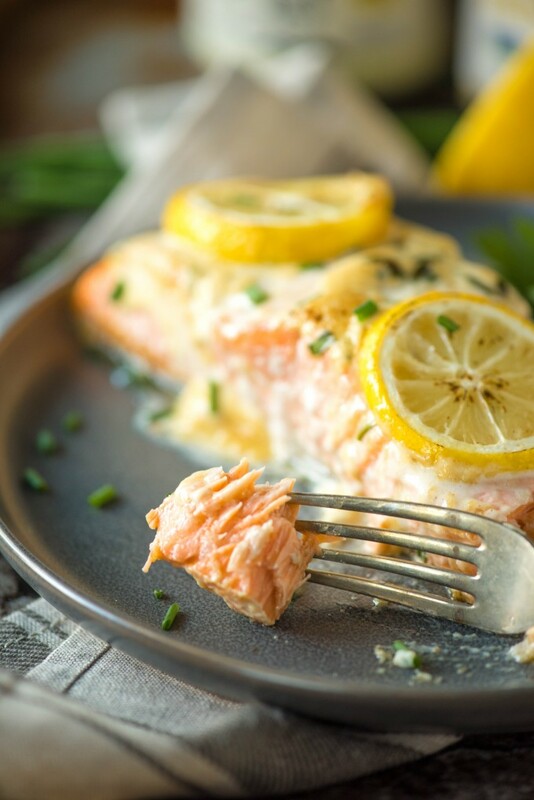 This baked lemon salmon recipe fits the bill to a T- with the added bonus that (while I am not a dietician) I have to think its healthier for you on the sliding scale of what you’ll be eating this season! If you’ve never coated fish in mayonnaise before, you need to get on board. Although I was similarly skeptical the first time it was recommended to me, I was hooked (pun intended) the first time I tried it. The fish stays incredibly moist as it bakes. 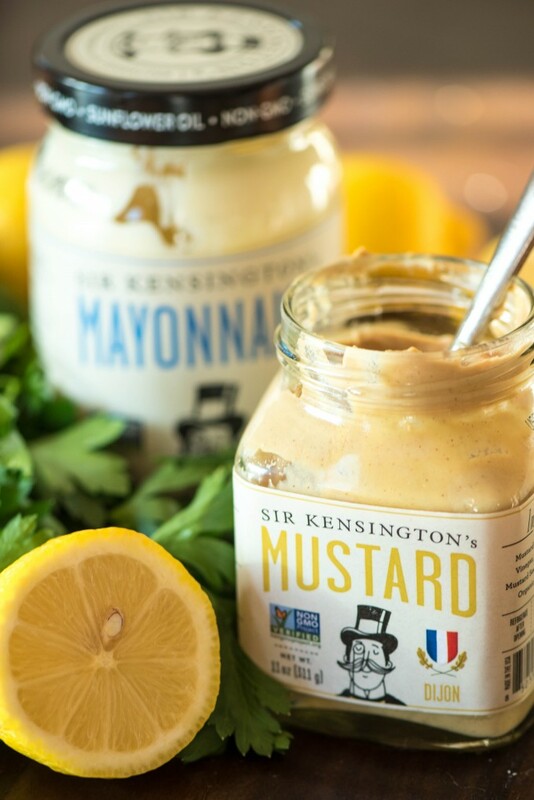 Although perhaps you’ll sound incredibly fancy when you tell your family you whipped up a dijonnaise for dinner, we won’t tell them that its an incredibly simple sauce of mayonnaise, dijon, and lemon. I used Sir Kensington’s Mayonnaise for this- it really does make a difference. After buying their mayonnaise to use in a burger contest over the summer (by the way, I totally won, NBD) and seeing how exceptionally different it was from every mayo that I had had in my life up until that very moment, I was hooked. Not gelatinous in any way, it is smooth, creamy and tangy, and is perfectly complemented by their Dijon Mustard as well. 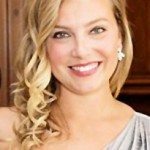 Line a baking sheet with parchment or foil for easy clean up. Dry your salmon filet well, then lightly sprinkle olive oil over foil or parchment. Place the salmon on the olive oil and set aside. In a small bowl, stir together the mayonnaise, dijon mustard, chives, salt and pepper to taste, and the juice from 1/2 a lemon. Pour dijonnaise over top of salmon, spreading to evenly cover. 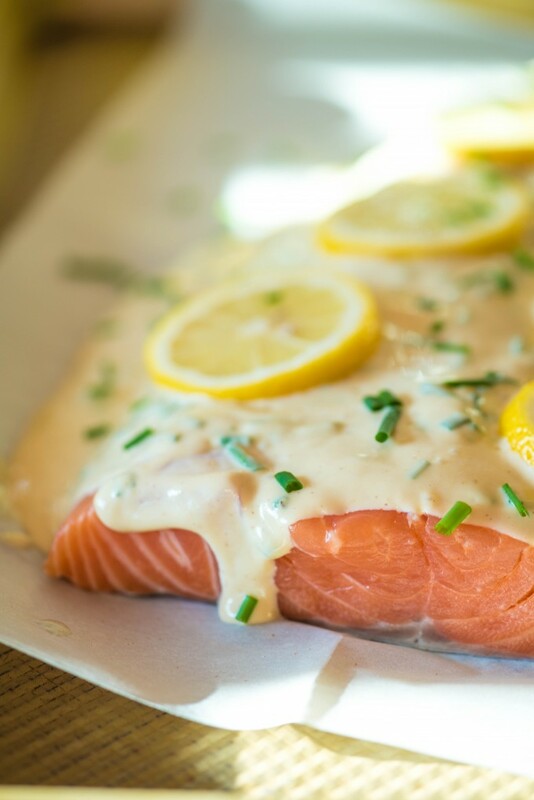 Slice the second lemon and lay over top of the coated salmon, pressing softly to adhere. 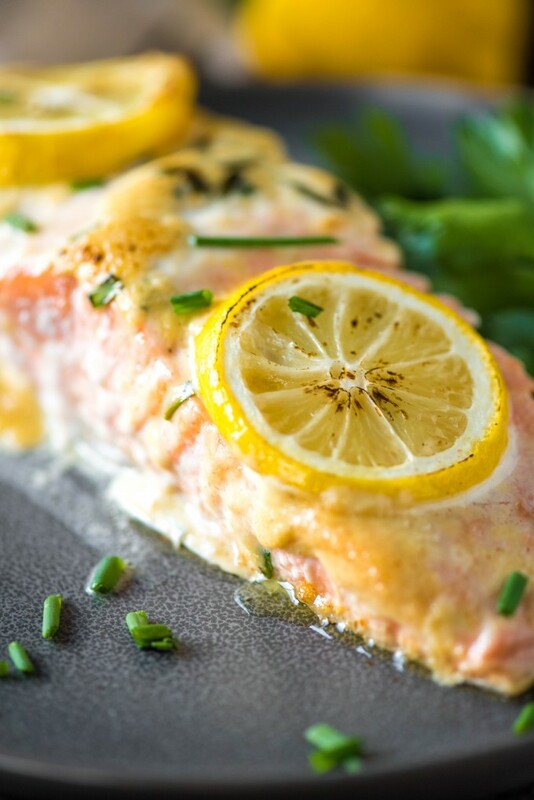 Bake in preheated oven for 20 minutes, until salmon is cooked through and flakes with a fork.